Firstly, thank you to the new wind blowing through East End Life (and to the reader who spotted it) for providing me with a new banner photo for this blog. Historic. Secondly, good luck to all the candidates for the bust-up on June 11. Peter Golds was selected as the Tory candidate on Monday after a hustings at the Bow Belles pub in Bow Road. He secured 33 votes against seven for the only other candidate Ahmed Hussain. Ahmed’s pitch was that the Tory party needed to show more that it can and does reach out to the Bengali community. It’s worth noting that he’s taken much flak from people he had considered friends for siding with the Conservatives and he has played an important role in recent events over at the Royal Courts of Justice. Fortune favours the brave. There is a discussion about this among the Wikipedia editors here. One editor has questioned whether she, as a mere councillor, is actually “notable” enough to have a Wiki page. The neutrality warning works both ways of course: it can apply as a warning to her or her supporters, for example, or to her enemies. Either way, over the past two weeks entries that have been critical of her have been added and removed several times. In April 2015 following the discharging of office of the former Mayor of Tower Hamlets Lutfur Rahman, Khan along with the remaining 17 Tower Hamlets First councillors were all named by Commissioner Richard Mawrey QC as being elected to Tower Hamlets Council as a result of corrupt and illegal practices. At various other times references to her husband Cllr Aminur Khan’s association with the IFE have been added and deleted. In February 2013 Khan was widely critized for her use of taxi’s at taxpayer’s expense whilst apparently undertaking duties as a councilor. On one occasion Khan billed the taxpayer for £120 for a journey of just 1.5 miles. The reference number 20 at the end of that sentence is to the piece I wrote on this blog in 2013. Despite those figures coming directly from council papers, a Wikipedia editor stated that wasn’t a strong enough source and deleted the entry. All this can be seen in the Revision History of Rabina’s wiki page here. In total, there have been 65 edits since April 25 when it was clear that Rabina would become Lutfur’s nomination. So who’s been behind all these edits? The revision history gives us a few IP addresses. One, which has been adding in some of the critical stuff, ie 91.213.110.4, is Tower Hamlets council IP address. So this is someone who works there. This IP address also matches an account called A Wikia Contributor at the London Birders Club. And on Wikipedia, this IP address has also been responsible for deleting information from the Wikipedia page of Labour councillor Shiria Khatun. I don’t know who this is and the IP address has never left a comment on this blog. A couple of the other IP addresses listed on the revision history as having added in critical sections about Rabina also match IP addresses that have left comments on this blog before. Again, I don’t know the real names behind these people. One of the most active critics has been a Wiki user called OneTowerHamlets, whose IP address details do not appear. Perhaps someone can help me with that. Those who have been deleting the critical comments on Wikipedia fall into two categories: responsible Wiki editors who are trying to determine what’s accurate or not, e.g. PatGallacher; and those who have only a very recent Wikipedia editing account. One of those falling into the latter category complained that the taxi fares were being cited from a blog. They suggested this was against Wikipedia rules. Seems a silly rule to me. This same user was warned by another Wikipedia regular that their IP address appeared to be “very close to the individual in question”, ie Rabina. The mystery of it all, eh? Politicos seem obsessed with editing Wikipedia. Such strange people. Interestingly, of the challengers from the two other main parties in Tower Hamlets, only John Biggs has a Wikipedia entry. It’s small and straightforward (could make a Biggs campaign logo that possibly…). I wonder if Peter could persuade Sir John Major to bring his soap box for a bit of campaigning. Meanwhile, tomorrow it’s the Boishakhi Mela in Victoria Park. Le merde could be about to hit the fan on the running of that event…again. The Commissioners at a public meeting at the town hall this week decided to reject a £75,000 request for a council grant/subsidy because they were unhappy that fully audited accounts had not yet been provided for previous years and because of concerns the Mela was becoming too much of a commercial venture. The man behind the Mela of course is our old friend, Shiraj Haque…Lutfur Rahman’s backer. He lost control of it in 2007 following a damning audit report commissioned by then council chief executive Martin Smith (would he ever return??) and then leader Denise Jones. After Lutfur became Mayor, Shiraj was able to take charge again (with the blessing of Stephen Halsey). In the past couple of years, the trust/charity that runs the Mela (let’s see if the Charity Commission have a closer look at that arrangement) had more luck with its grant applications. In 2012, Lutfur gave it £180,000, in 2013 £170,000 and last year £100,000. The latter two amounts came from the infamous £954k slush fund identified by the PwC auditors last year. The Commissioners will no doubt be blamed by some if as a result the Mela trust falls into the red, but good for them for being tough. Senior officers should have had more balls in the past. The Mela is a great event and it’s right that it’s given the use of Victoria Park for free (a cost worth £25,000). The problem is with the people running it. I’m sure it’s not just me who’d like to see a full forensic audit carried out. Perhaps the council should just run it entirely again. After all, Sir Robin Wales runs a successful Mayor’s Day in Newham every year. Meanwhile, the council continues to deflect any questions over scrutiny. Here’s a Freedom of Information request that I asked on this earlier this year. Please supply all documentation, but primarily third party invoices, provided by the trust responsible for the Boishakhi Mela to support /justify its receipt of council money. I’d also like to see the trust’s detailed accounts. This request relates to four years: 2011-14. For example, in the case of the security company used for Mela, I’d like to see all invoices submitted by the hired contractor. I’d like to see the results of any council post-audit of its grants to the mela for each of those years. In 2011 the Mela was run by the council and there is therefore no trust involved or information falling under the scope of this request. For 2012 and 2013, invoices are held by externally commissioned auditors and we have asked for these to be provided to us. I will contact you once they are received. The invoices for 2014 are not yet collected. The audit report for 2012 has been completed and is held by the Council However the Council is of the view that this is exempt from disclosure under section 41 of the FOI Act 2000, as information provided in confidence. The audit report disclosure would constitute a breach of confidence actionable by the author of that information. The Terms of Business under which the report was commissioned stipulate that that the report is confidential and for the exclusive use [of the Council] and must be used solely, for the purpose described in the Engagement Letter. Disclosure of the audit report would, therefore, constitute an actionable breach of confidence and the Council could be subject to claim for breach of contract as such. Section 41 is an absolute exemption. It is also considered that section 40(2) would also be applicable to parts of the audit report as it contains personal data. The requested information is (or contains) the personal data of other people. Section 40(2) of the Freedom of Information Act sets out an exemption for third party data if disclosure of the information to a member of the public otherwise than under FOIA would contravene any of the data protection principles. The first data protection principles states that we can only disclose the personal data if to do so would be fair, lawful and meet one of the conditions in Schedule 2 of the DPA. This means that, if the disclosure would not be fair, the information must not be disclosed. It is considered that the provision of this information would not be fair as the person it relates to would not expect the information to be released in this way. This is an absolute exemption and the information cannot be provided to you. Furthermore, the Council is of the view that it’s disclose is also exempt under Section 43 as its disclosure would, or would be likely to, prejudice the commercial interests of the Trust, auditors and the Council. This is because the report contains detailed information relating to the governance structure and accounting/banking arrangements of the Trust. It could, in our opinion, be prejudicial to the Trust’s commercial interests if this information was disclosed to a third party. Appendix 2 to the Report contains the Auditors Engagement Letter and thus sets out the confidential terms on which they agreed to perform the services for the Council. It contains details of the fee, engagement team and other terms of engagement. Such information is commercially sensitive and in the hands of a competitor is likely to cause prejudice in terms of tendering for future work. The 2013 audit is yet to be completed and the 2014 audit has not yet commenced. *** Please note that being NAMED in the election petition judgement is a specific legal term. It means being publicly declared to be guilty of an election offence. That the figures quoted by the press release were correct was confirmed by Councillor Rabina Khan, the Cabinet Member responsible for housing. There was much cross-examination as to whether the criticism of cronyism in the housing programme was fair or unfair. Fortunately the court is not concerned with the rights and wrongs of the dispute save to say that Ms Khan’s assertion that, in allotting housing money, the Mayor always followed the advice of his officials fell a little flat in the light of the evidence of his attitude to council officials when it came to allocating grants. Shadwell’s grant increased from £204,386 to £460,750. 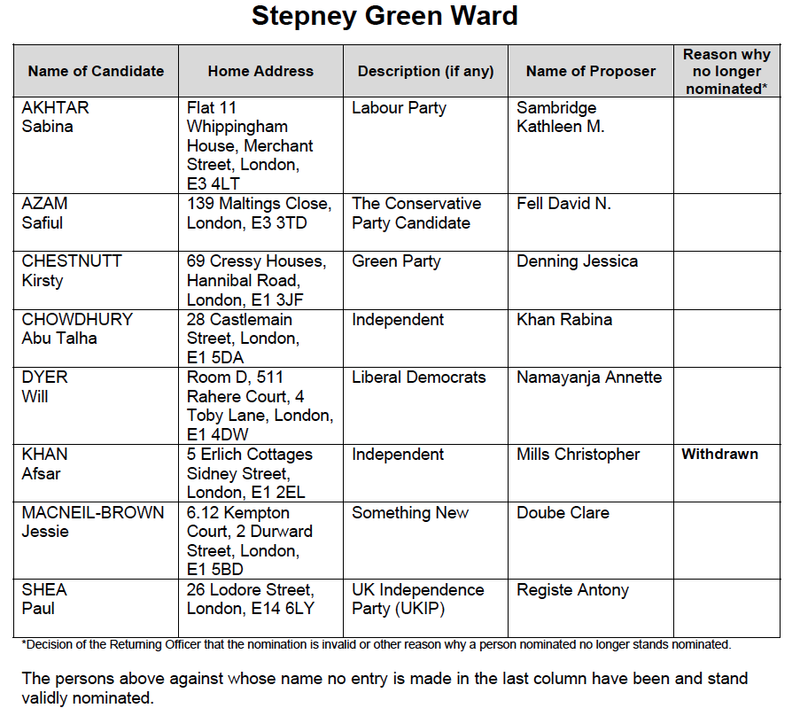 Shadwell returned two THF candidates, one of whom was Ms Rabina Khan. Bow East, on the other hand, saw its grant reduced from the officers’ recommendation of £99,397 – cut by roughly a third to £67,000. But then, Bow East returned three Labour Councillors. Despite the criticisms made by the Election Commissioner (the judge), Rabina Khan was not named in the judgement in the legal sense, perhaps because she was never complained-about in the original election petition. Please remember the distinct legal difference relating to being named . As Ghulam Rabbani has been cited above may I give this link to a 2012 contribution to that well know site of veracity Left Futures run on behalf of Michael Meacher by Tower Hamlets based Trot Jon Lansman. I do this not for any rubbing of anything in but because I believe that people who have come to this discussion of late may not know the full history. Lansman, who was one of the drafters of the longest suicide note in history usually known as the Labour Manifesto of 1983, has withdrawn from the fray but I think it is worth reminding people, and I will be doing that, of positions taken which are now indefensible. I should have said look at both sides of the leaflet he complains of and see if you think that any of it is untrue. Fellas! Anyone going to Rabina’s do at Madani Girls School, Myrdle Street? It’s today at 6pm. And whilst there, can someone ask her why’s pretending not to be writing her own Wiki? That’s wemin for you! Sorry. Shurley Wimmin. With apologies to whoever. Vermin may be more apt when mentioning Rabina Khan? CC. Could you put up here the post by Giles Fraser in today’s Al Grauniad? I can do it but it takes time. It is an unbelievable apology for Lutfur, cringe making. CC. Could you put up here the article in today’s Al Grauniad by Giles Fraser. It is total crap and we can have so much fun taking it apart! I can type the whole thing but Wetherspoons is open! Is it one rule for the Hindus and another for the Muslims? David Cameron has a longstanding relationship with the 600,000-strong Hindu community. ………………………. 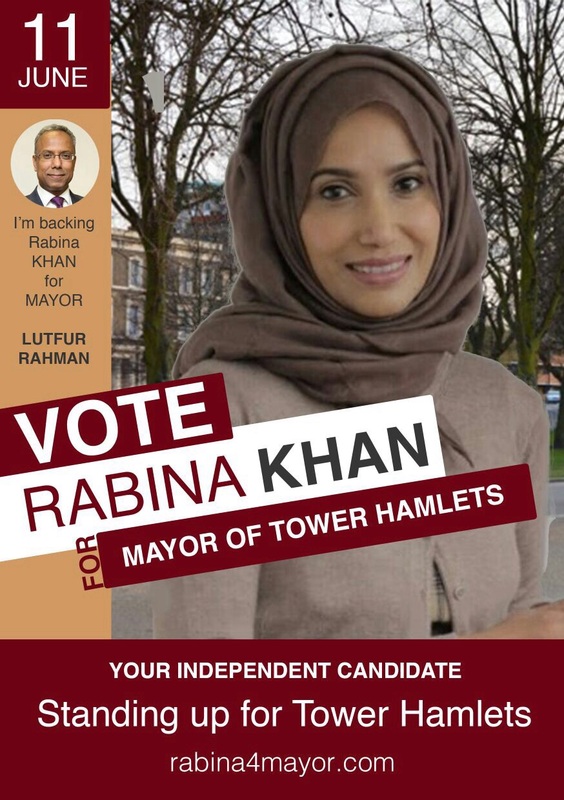 (1) Around the same time, another endorsement – written to a Bangladeshi newspaper by 101 imams – was being cited by the election commissioner, Richard Mawrey, as one of the reasons that the 2014 re-election of Lutfur Rahman as mayor of Tower Hamlets should be voided. This letter, argued Mawrey, contravened the law against undue spiritual influence – a law unused and pretty much unheard of since the 19th century. It was first invented to stop the Irish working classes from falling under the influence of the Catholic church after the introduction of secret ballots (which meant that landowners could no longer control how their tenants were voting) and was bound up with a racist view of the Irish as stupid and with conspiracy theories about Catholicism as some alien power intent on taking over. (2) So why was the imams’ letter a reason for Rahman’s election being voided but Patel’s letter not a reason for Cameron’s election being voided? Like Patel’s letter, it contained no sense of threat, nor implication of any spiritual consequences for those who chose to vote otherwise. Yet, in an astonishing display of double standards, the imams’ letter was used to void an election result and Patel’s letter has passed with barely a mention. So maybe this is, deep down, really about Islam. For just like English attitudes towards Catholicism in the 19th century, English attitudes towards Islam often regard it as some malevolent and foreign power, requiring exceptional legal treatment – including silencing at election time. (3) “Why are all the free-speech humanists so quiet about this?” asked Conor Gearty, professor of human rights law at the LSE. And the answer is probably that many of them dislike religion more than they support free speech. (4) Yes, there were other important reasons that Rahman’s election was dodgy: vote-rigging, corruption etc. And because of this – and anxious not to be seen as an apologist for Rahman – many have been reluctant to question Mawrey’s interpretation of the law of spiritual influence. But obscured by the public outcry against Rahman, Mawrey has opened the most enormous can of worms. It is possible Mawrey got the law wrong. In a legal opinion I commissioned, one leading QC has challenged Mawrey’s interpretation as, among other things, inconsistent with the European convention on freedom of expression. (5) But the question at stake here extends far beyond the mayoralty of Tower Hamlets. Should religious leaders have the same freedom of political expression as non-religious leaders? Unions advise their members on voting. Business leaders write to the newspapers doing the same. Or are we religious types so uniquely gullible and easily led – and our leaders so manipulative – that a law is necessary to silence us from expressing political opinions? It is possible Mawrey got the law wrong. In a legal opinion I commissioned, one leading QC has challenged Mawrey’s interpretation as, among other things, inconsistent with the European convention on freedom of expression. I am absolutely certain no barrister, not even a QC (or as the Irish call them a Senior Counsel) would make such a sweeping statement without a lot more prose that could be questioned by enquiring minds, such as my mind for example. So where oh where has Mr Giles Fraser hidden the whole of the alleged ghost QC’s professional (or non-professional in a pub or wine bar) advice ? Just what is Mr Giles Fraser’s reason for deliberately concealing the WHOLE TRUTH of the alleged legal advice from an anonymous lawyer ? Whether Rahman and the other bastards, who exist in the Labur Party too, like it or not NO ONE SHOULD DICTATE TO A VOTER HOW THEY MUST VOTE. That, Mr Giles Fraser appears to ignore, is contrary to Free and Fair Elections. It is amazing that any newspaper would actually pay a person to write so much crap. Mr Giles Fraser is certainly no expert on UK elections or on UK election laws otherwise he would be aware that the election laws are totally unfit for purpose. on May 16, 2015 at 11:25 pm You couldn't make it up! I herewith withdraw my erroneous remark Just what is Mr Giles Fraser’s reason for deliberately concealing the WHOLE TRUTH of the alleged legal advice from an anonymous lawyer ? . Currently reading the opinion. Think Professor Giles Fraser asked for an opinion on the wrong thing or did not place his request in the context of the Tower Hamlets hanky panky even though those events were, I believe, foremost in his mind, foremost in his thinking and which provoked his seeking of an opinion for it remands just that – good, bad or indifferent until tested in a court. Opinions belong not in abstract isolation but always in context because life operates always in one context or another. Chamberlain mentioned One of these practices, which Mr Mawrey found proved, involved the publication in a local newspaper of a letter from a group of imams urging Muslims to vote for Mr Rahman. This, he held, amounted to “undue spiritual influence” contrary to s. 115 of the 1983 Act. Chamberlain: But there would be no offence in merely expressing a view about the merits of a candidate at an election; nor in urging congregants or others to vote for or against a particular candidate; nor in asserting a moral or religious duty to vote for or against a particular candidate. But Chamberlain fails to grasp the distinction between opinions freely exchanged between equals, more or less, in general conversations when everyone (almost) expresses, or has an opportunity to express, their own opinions. In the Mosque none of the congregation ever has any opportunity whatsoever to contradict or to question the perceived wisdom of the Imam or preacher. Inside the Mosque the relationship between the members of the congregation and the Imam is one of unquestioning subservience. It is not a relationship of equals or almost equals. It is one of obedience or else one is a bad Moslem. Does Chamberlain need to pop-in to a reasonable sized Moslem this Friday? They will make him welcome. The experience will certainly enlighten him. Freedom of Expression is about everyone being more or less equal. That equality does not exist in Mosques, particularly when conversing with the Imam and especially not at Friday’s main prayers. Friday’s sermon is essentially Instructions to the faithful. It is not a debate and it is not a general discussion. It is Official Advice by someone who knows what Allah thinks and, of course, wants. Chamberlain wrote: The primary factual basis for the Commissioner’s finding of undue spiritual influence was a letter signed by a group of imams and other senior Muslim leaders endorsing the candidacy of Mr Rahman and calling on voters to support him. This letter, written in Bengali, was published in the Weekly Dash (a local newspaper with a circulation of approximately 20,000) six days before the mayoral election. When Moslem Leaders , including Imams, collectively publish A Very Important Letter in the local press and that letter appears in one’s own home language then those who adhere to the Moslem religion and who come from the Bengali-speaking area, directly or through their parents, are extremely likely to take that letter as important Official Advice to ALL MOSLEMS. Chamberlain seems to fail to grasp this reality. Perhaps he needs to get-out more and mix with parts of the wider community he appears to know very little about. Being clever is usually insufficient and never a proper substitute for ‘on the ground knowledge and experience’. I am not going to read the rest of Chamberlain’s opinion because I think it is senseless waffle. The instance Chamberlain failed to grasp the significant material difference between an opinion expressed in an atmosphere and in circumstances when a contra opinion may also be freely expressed and a de facto edict to a group of obedient generally older and less well educated Moslems, whose tendency is not to ever question one’s betters, one’s social superiors and especially those representing Allah, Chamberlain failed understand the circumstances expertly detected by Mawrey’s superior understanding of the then status quo. To all you lawyers out there ……. have I got it right ? If Chamberlain is really a ‘Human Rights’ lawyer I ask why has he got Freedom of Expression so wrong? Everyone has the right to freedom of expression. This right shall include freedom to hold opinions and to receive and impart information and ideas without interference by public authority and regardless of frontiers. This article shall not prevent States from requiring the licensing of broadcasting, television or cinema enterprises. Now, not being a lawyer, I would like to challenge Chamberlain on the letter of the law. 1. That letter was an instruction or a command. 2. That letter was NOT anything remotely resembling an opinion or unbiased, and therefore challengeable or debatable, information and it was definitely not anything like an idea which can be considered, experimented with or even ignored. 3. Instructions and commands are not, and have never ever been, anything that can honestly qualify as Freedom of Expression – because Freedom of Expression is essentially an opinion which can be challenged, ignored or even improved upon. One can not do those things when in receipt of an Order from one’s superiors. I want (universal) Human Rights; not Tory Rights ! It was not (Leigh Day) because that is the name of the solicitors that instructed him on behalf of Dave Robert’s ‘friend’. Him being, Martin Chamberlain, whose name appears after para 48.
on May 17, 2015 at 11:11 am Dave Roberts. Giles, £2000, Fraser is basically saying that because of of the reasons given by Mawrey for removing Lutfur was the letter from the imams then the general election should be voided because of the Hindu letter. If this weren’t such an important issue then quite clearly it would all be a bit of Al Gruaniad childish foot stamping like that of another non entity like Dave Hill. Unfortunately Fraser is allowed to spout this garbage in what is supposed to be the newspaper of the liberal left and one which is still, God knows how and why, taken seriously. A look at the comments, at least the ones that are allowed by the censors, on Comment is Free which it most certainly isn’t, show how out of touch the editors of the Guardian are with even their own readers. It is possible for writers like Polly Toynbee to have hundreds of comments all of which are hostile some vitriolically so. The reasons for this are the same ones that lost Labour the election and that is that both party and paper are stuck with and are sticking to time worn slogans and positions that have been proven untrue and with a little bit of journalistic investigation could have been avoided before the inevitable disasters. While real journalists like Andrew Giliigan and Ted were doing what journalists are supposed to be doing and actually investigating what the likes of Livingstone and Lautfur Rahman were actually up to The Guardian either ignored or knowingly covered up the corruption of both regimes. The editors of Soviet papers could at least plead that they would have suffered the same fate when they covered the purges of millions of people ordered by Seamus Milne’s favourite dictator Stalin. The same excuse could have been used in relation to the forced famines of the thirties when Pravda claimed record harvests and ran stories with photos of waving cornfields and happy peasants. The editors of The Guardian have no such defence. They ignored the voices which were pointing out the massive financial corruption in the various Livingstone regimes in London and if they had read Ted’s blog over the last four years the same corruption in Tower Hamlets would have been equally obvious. They suffered and still suffer, witness Fraser and Hill, from the entrenched positions they took on these and other issues. Livingstone, for them and sections of the left from the liberal to loony, was the only defence that Londoners had against a fascist Tory regime that was going to deport all ethnic minorities, slash wages and double or triple rents and fares. Rahman was of course the victim of an Islamophobic witch hunt that simply couldn’t stand a successful ethnic minority mayor who had united all of the many faiths and communities in Tower Hamlets behind a campaign to end poverty, build thousands of affordable houses and dozens of new hospitals and schools. The fact that both men ran provably corrupt virtual one party states backed by semi secret reactionary organisations, Socialist Action and IFE, was neither here nor there. When Livingstone ran anti racist festivals and community projects through which his cronies creamed off millions, when he appointed dozens of advisors on hundred k salaries, when he opened ” embassies ” and feted shysters like Hugo Chavez and Jesse Jackson he was simply standing up to ” Imperialism” and had to be supported. The fact that Rahman ran a kleptocracy that any third world dictator would be proud of and feted Saudi clerics who called Jews pigs and snakes didn’t matter because he too was standing up against the hated New Labour and Imperialism. The left, both liberal and loony, performed the same political, I won’t use the word moral in relation to them, gymnastics to justify both Livingstone and Rahman that they did whitewash the mass murderer Joseph Stalin. The Guardian, its editors and contributors are left with little if any credibility from the whole Rahman fiasco in Tower Hamlets but there is one thing they could do. Both Andrew Gilligan and Peter Golds have pointed out a small but significant victory for decency in political life which The Guardian has, as far as I know, studiously ignored. The Lutfur Rahman paid for and Ken Livingstone groupie Jenny Fisher edited London Bangla published a special edition just before the 2010 mayoral election which, amongst other things, smeared the Labour candidate Helal Abbas Uddin as a wife beater. Eventually the Crown Prosecution Service charged the editor with various criminal offences and then, unexpectedly and with no explanation, dropped them. Uddin pursued the matter through the civil courts and a few weeks ago won his case with an admission from the editor that there was no truth in the published article and an agreement on costs and damages. One would have thought that this would have been of interest to keen Guardianista Tower Hamlets watchers like Dave Hill who would have been on the phone to the victor asking for an interview. Well, you may have thought that but it didn’t happen. The reasons aren’t difficult to divine. I have previously described Hill as Livingstone’s arse licker in chief and it was Livingstone of course who defied, and still does, the Labour Party to get rid of him for openly backing Lutfur Rahman against Uddin five years ago. Over a decade ago, when the leader of Tower Hamlets council, Uddin brought in forensic accountants to go over the books of various council funded Bangladeshi projects. These accountants then brought in the police and the matter ended up with three people going to prison. One who escaped that fate was Livingstone advisor Kumar Murshid but the case and publicity finished him. Livingstone harbours grudges and this obviously extends to his journalistic lackies. Maybe The Guardian and Dave Hill could start to make amends to the people of Tower Hamlets and Uddin by an article on the case or maybe Uddin himself could write one. I’m not holding my breath and I doubt if anyone else is either but it would be a start. The conditions necessary for Freedom of Expression to function. 1. Someone has to be present listening or the Expresser must have practical access to a broadcast medium – examples: radio, web and newspapers. 2. If no actual access to third parties, actual or probable, then Freedom of Expression can not function. Shouting-out one’s opinions to the wind does not count as Freedom of Expression. 3. The ‘freedom’ in Freedom of Expression necessitates the recipients of that Expression having the unqualified freedom to respond to the Expression, should they wish. 4. When the recipients of the initial Expression have no ability or capability to question, challenge or engage with the substance of that Expression, then the Expression is exercised in a dominant manner and not in a manner of freedom and equality. 5. When a dominantly delivered Expression is given by a person or persons having a degree of authority or control over the recipient (for example religious, employment, social, legal or even by a person pointing a gun) the alleged Freedom of Expression does not exist because the recipient lacks the ability not to hear it or to freely reject it. 6. Forcing a recipient to hear an Expression negates the voluntary aspects of Freedom of Expression. Freedom of Expression never exists when one has a loaded gun in one’s back and one is told to say this ! 7. Essentially all Expressions require a universal freedom from duress when saying them and a corresponding freedom from duress to consider them and the innate ability to challenge them. 8. When an Expression is delivered by a superior to an inferior in circumstances lacking an equality of exchanges of opinions and believes, the validity of the Freedom of Expression ceases to exist. The Expression has become a demand or order. Perhaps others can improve upon my thinking. Does anyone known whether the Tower Hamlets Imams’ letter contained a telephone number, email address or postal address specifically for the purpose of contradicting or questioning the Imams’ de fact order ? See if those work and I’ll do some Daft Dave Hill later. a) You won’t get the IP details of the OneTowerHamlets account. That information is only available to “Checkusers” who are responsible for checking sockpuppetry, ie whether accounts are operating from the same IP address. This is never given out publicly. However, it is possible to file a report on an account and other accounts (or IP addresses) you think it has been editing from to get around the rules. This will only confirm whether or not the accounts/IP addresses are linked. c) the specific notability criteria for politicians is that they must have sat in a national or state legislature, which Rabina hasn’t. However, if she meets the general notability guideline, this doesn’t matter. I’d have hoped my blog was a reliable and authoritative source. In fact it’s already used for references elsewhere on Wikipedia. on May 16, 2015 at 11:20 pm You couldn't make it up! Ted – I think you might be able to make a case for your blog as support for points being made on Wikipedia on the basis that you are a proper journalist, that you’ve won awards for journalism and that your blog is a matter of Court record in terms of the Electoral Court judgement. Bottom line that your professional life depends on the way you adhere to ethical standards re reporting. Why not have a go? I certainly think it’s worth making the point. I think the editors will see sense. You sound American. Tower Hamlets is another country. This was for the Wiki guy in case anyone was confused! I’m British and live in Whitechapel. I find it slightly bizarre that my comment above has been downvoted. I thought it would be useful for people to understand how Wikipedia works. Are the facts unwelcome? I welcome facts in easily digestible segments fully indexed. Getting reports that Rabina’s leaflets have been going out with East End Life in some areas. Any other intelligence from around the Borough?. It beggars belief after Mawrey that Lutfur’s crew would be so stupid and so cavalier, and what our commissioners doing about it? sorry missed out an “are” in the last clause what are our commissioners doing about it? Full details on the Love Wapping blog. Great work by Mark. Will do write up tomorrow. It was THH leaflets with hers not EEL. The THF position is that they’ve been framed by a dirty tricks campaign. on May 16, 2015 at 11:16 pm You couldn't make it up! Oh Judith – you beat me to it!!! My fingers were posed to say exactly the same thing! on May 16, 2015 at 11:15 pm You couldn't make it up! A query – for those who love the legal stuff. If somebody has been banned from participating in a Mayoral election, can his photograph appear on election material? I would have said no – that the ban covers all participation – including mug shots on posters, election material and appearing at any events. Can somebody please get a ruling on this because if I’m right Rabina might just have breached electoral rules and have to shred all her election material! Yes because he is NOT the candidate. The status of his photograph and personal endorsement of the candidate – in the candidate’s own election material – is exactly the same as an other member of the general public. Participating in elections means, I verily believe, as a validly nominated candidate. A ban might, or might not, prevent the banned person being a third-party promoter in the election although the very small permitted third-party expenses amount is unlikely to do any candidate harm or good. on May 17, 2015 at 2:33 am You couldn't make it up! Surely the point he is NOT the same as any other member of the public? He is a person who has been specifically banned from being a candidate because he was found to have corrupted the electoral process for a number of different reasons. I still reckon it’s worth checking the point with somebody who is a lawyer. It is declared that Mr Rahman shall be incapable of being elected to fill the vacancy for the office of Mayor of the London Borough of Tower Hamlets under s.164(1)(b) of the 1983 Act. There’s nothing to stop him appearing on a leaflet. He just can’t be a candidate. He is also barred from voting as I understand. on May 17, 2015 at 12:33 pm You couldn't make it up! 1) When is an Independent Candidate a puppet of one who is barred from standing or voting in the election for Mayor. 2) Can a person barred from election be a promoter? 4) Is Tower Hamlets Council ever going to be capable of running and regulating a fair election? 5) Are the Tower Hamlets Commissioners – and in particular Barry Quirk – paying any attention to what is being said this blog and what’s been evidenced on ‘Love Wapping”. 1.25 An imprint must, by law, be added to campaign material to show who is responsible for its production. It helps to ensure that the campaign is transparent. 1.27 The promoter is the person who has authorised the material to be printed. If the promoter is acting on behalf of a group or organisation, the group or organisation’s name and address must also be included. 1.28 You can use either home or office addresses. 1.29 If you are putting an advert in a newspaper, your advert does not need to include the printer’s details. 1.30 A standard imprint should look like this: Printed by [printer’s name and address]. Promoted by [agent’s name] of [agent’s address], on behalf of [candidate’s name] of [candidate’s address]. 1.31 If the candidate is also the promoter of the material, the ‘on behalf of’ part of the imprint is not required. 1.32 In all cases, you must make sure that the imprint lists all the promoters and organisations involved. Where do you put the imprint? 1.33 If your material is single-sided – such as a window poster – you must put the imprint on the face of the document. If it is multi-sided, you must put it on the first or last page. 1.34 You should also put an imprint on electronic material, such as websites and emails. The imprint should include the name and address of the promoter and the organisation on whose behalf it has been produced. • Produce material that looks like the poll cards sent to voters by the Returning Officer. • Pay people to display your adverts (unless they display adverts as part of their normal business). So was that chap in the videos and photos paid to distribute that election material as witnessed by Love Wapping? (1) When is an Independent Candidate a puppet of one who is barred from standing or voting in the election for Mayor. Not relevant. to the pending election. (2) Can a person barred from election be a promoter? That – on its own – does not stop Rahman promoting any candidate and it does not stop him being a so-called ‘Third Party Campaigner’ either. Never. No ability in law. That annoys me in relation to non-TH elections. The police are too busy/tired/uninterested etc. 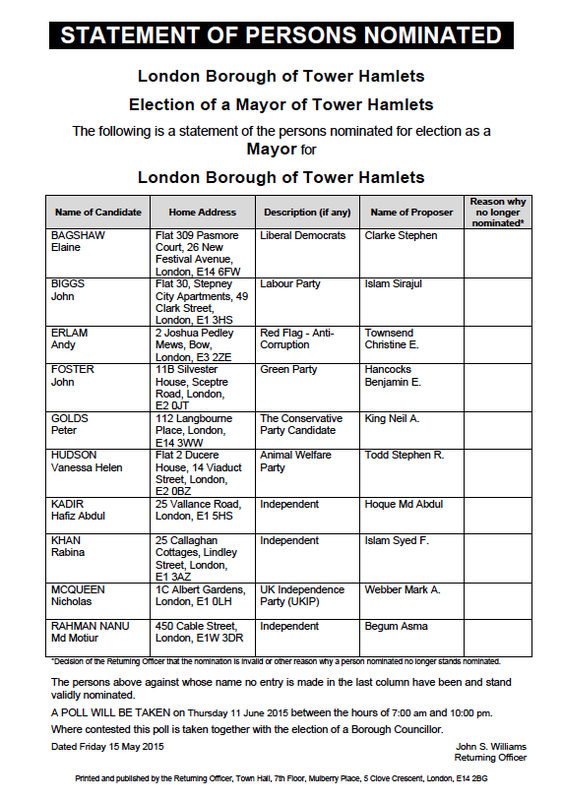 (4) Is Tower Hamlets Council ever going to be capable of running and regulating a fair election? Never in my understanding of ‘fair’ elections unless the unfit-for-purpose UK law is drastically improved. The ‘fair’ problem is significantly wider than mere Tower Hamlets. (5) 5) Are the Tower Hamlets Commissioners – and in particular Barry Quirk – paying any attention to what is being said this blog and what’s been evidenced on ‘Love Wapping”. Only if someone makes a concise summary and presents it to them with evidence and only if the concerns are within their brief (allocated responsibilities). on May 17, 2015 at 1:20 pm Dave Roberts. Does anyone know where the 400 plus affordable homes that as cabinet member for housing Rabina Khan was responsible for building actually are? on May 17, 2015 at 4:17 pm Dave Roberts. Sorry, that should have been 4000 affordable homes. Although it will probably be 40000 by this time next week! Affordable to whom precisely ? Beggars, dustmen, bus drivers, nurses, firemen, paramedics, shop assistants et cetera, et cetera, et cetera. Oh, did you mean millionaires and overseas based property speculators ? UK governments, Labour, Tories and Lib Dems, have presided over an immoral and obscene houses (and flats) price inflation. Some other EUROPEAN countries don’t have it, so why should slovenly class-ridden sub-standard England have it ??? Time to clean-up the government and put the public’s best interests first – and that is not putting more people on to the streets ! Dave, many of those new affordable homes are in my ward, Canary Wharf and next door in Blackwall & Cubitt Town. They are delivered as part of the many new private developments underway. Most of these recently approved have 25% social housing although the target is 35% to 50%. The actual % delivered is meant to be based on a viability test undertaken by external consultants but as far as I can determine nobody in the Council has negotiated the % directly. The social housing is generally in the same development but sometimes it is built elsewhere i.e. City Pride. On the Isle of Dogs we have about 34,000 new housing units in the pipeline which implies 8,000 social units IF they are all built. The social housing is generally split 66% social rented and 33% affordable for sale although in my ward many of the affordable family units are technically not affordable based on the rules. Why can’t England have socially affordable homes meaning at a fixed low price that is genuinely affordable and not exploitative ? When Maggie* went off her head and stopped councils building homes, introduced profit-making Housing Associations (now officially called in government documents Private Providers of Social Housing – the RSL being dropped years ago) up went the rents to above council levels. Councils can legally build their own homes, and have been able to do so for almost 10? years, but the uncaring morons (whoops councillors especially Labur) deliberately do not. Consequently the poor public are again ripped-off with higher than council rents. That is not fair. * The same Maggie who caused the Falklands War. on May 17, 2015 at 8:21 pm Dave Roberts. One for you CC. I knew that the name Leigh Day solicitors rang a bell and it turns out they were one of the firms of lawyers who made false claims of murder and brutality against British soldiers in Iraq. Have a look at articles in The Mail and the FT for details. They had some of the £30 million plus legal aid for the case which totally collapsed. Whoever wrote the above is living in cloud cuckoo land and knows very little about Muslims and the relationship with their local Imaams. Most Muslims in the borough probably do not know the name of their local Imaam, never mind remember what the subject of his sermon was from one Friday to the next. Whilst the Imaam is a person who leads prayers and imparts religious benefits, most of what he says on Friday falls on deaf ears. Generally speaking, the older more devout generation of Bengali men may listen, whilst the younger generation can be divided into two camps. One camp would rather take his religion from “YouTube Sheikhs” than a less credible local Bengali Imaam who doesn’t speak a word of English/Arabic who probably learned his Islam from a village madrasa in Bangladesh. The second more secular/liberal/nuanced Muslim who probably wouldn’t attend the mosque if it wasn’t out of guilt (for all his misdemeanours of the previous week), wouldn’t question the Imaam but when it came down to acting on the Imaam’s sermon would just carry on as normal because it was out of synch with his lifestyle choice. So to say the relationship between the congregation and the Imaam is one of unquestioning subservience, is first degree bunkum. To think Muslims are a homogenised group of people, which the Judge did in this case is absurd, and it comes from very little understanding of the group. I’m not saying the judge needs to understand the group but if you’re going to invoke “spiritual influence” you damn well better had understand. I wonder if Mawrey knew the theological differences between the tablighi, sufi, salafi, jamate, ahle hadeeth, fultoli, or ikhwani stance on voting was before he passed his judgement? Whilst all of these various sects/subsects/groups are present within the Bengali community and they may all pray at the same mosques, it does not mean they take their religion from the Imaam of the mosque who may well be from a different denomination than his own. In summary, Muslims do have brains, can think for themselves, and there is a divergence of opinion within the Bengali-Muslim diaspora in Tower Hamlets. Mawrey’s judgement casts aside these differences writes off an entire community of pepole. That’s the law though and it’s all that matters, or not, if we are to believe Dangerous Dave Cameron Bhaisab. I wrote my comments about inside the Mosque based on probably 10+ attendances inside a large Mosque during the main Friday prayers. The Election Commissioner distinctly mentioned older Moslems and those of the type that never question their (alleged) ‘betters’. Yes indeed some Moslems have wonderful brains, just like some non-Moslems. Some Moslems think critically and independently. Others do not because of their upbringing and lack of a thought-provoking and questioning education. The Mosques I know do not mix denominations. They maintain their separate interpretations of Islam. Next time you mingle with the Moslem community perhaps you should try to understand the basics of all communities regardless of the communities religious background or lack-of. All elections should be honest and fair and not influenced in any manner by third-parties.